Every TNT-audio reader has an abiding love for music. Why else would you have a room full of ridiculously expensive audio equipment with loudspeakers the size of garden sheds...? "What about readers who don't like music and only listen to test tones?" challenge plebs, stage left. They don't read TNT-audio, replieth the old scribe, sagely. Music simultaneously makes direct connections to numerous areas of the brain, this is how it excites our thoughts while moving our emotions. Connections are made to the thinking parts of the brain (the cerebral cortex - the parts on the outer surface that look like a big pink walnut, confusingly called 'grey matter' in olden times) and to the parts that organise time and space, and music also connects to the limbic system where the emotions originate and the fight - flight - freeze mechanisms operate. Music Therapy taps into these direct connections either to help stimulate organisation of neural networks in clients whose disabilities are caused by or compounded by chaotic neural disorganisation, or to kindle new neural pathways for clients where there is damage. The former group might be caused by neurodevelopmental disorders or abuse very early in childhood. The latter might be caused by strokes, asphyxia, encephalitis, traumatic brain damage or infection. Current research programmes are investigating how much degenerative neurological conditions, like Alzheimers, are particularly helped in mitigating against the damaging effects and slowing the progress of the illness. Music Therapy (and the other arts therapies) has greater potential than talking therapies because of the extra sensory dimensions (especially for those with limits or damage to their verbal capacity) to stimulate these neurological changes. It is possible that it is the creative expressive element of these therapies that increases their effects compared to traditional occupational therapy, beneficial though that is too. The latest neuroscience research (particularly relational neuroscience) indicates that the potential is even greater than we had previously suspected. Music Therapy is always undertaken by a qualified Music Therapist who seeks, through a mutually developing relationship, to assist in the remediation of specific conditions, including emotional or physical difficulties, arising developmentally, or through illness or damage. Through sensitive observation and subsequent choice of appropriate elements of music, the Music Therapist aims to establish an interaction, via a shared musical experience and activity. It is this interaction, sometimes entirely without words, often with the therapists commentary on the elements, that leads towards the therapeutic goals that are determined by the nature of the participant's condition. The ability to appreciate and respond to music is an inborn quality in human beings. It is well known that this ability frequently remains unimpaired by disability, injury or illness. People who have difficulty in understanding their environments, or whose verbal communication limits their expression, may nevertheless be stimulated by music and respond to it. BCAT is probably unique in that it offers an independent centre for other agencies, who could not justify music therapy provision in situ, to get this valuable therapy for their clients. BCAT is also unique in that it offers all 5 supra-verbal therapies under one roof. BCAT also offer training opportunities for Music Therapists and other arts therapists from all over the world. BCAT have been in the forefront of developing initiatives for research and professional training and also have education programmes in tandem with academic institutions. "J, D & R, who suffer from severe Autism have been accessing Music Therapy sessions for a few years. It is noticeable that when they have finished each session they are far more focused and relaxed than usual. The sessions help with their sensory needs, eye and hand coordination and social interaction. Their sessions are not only beneficial within the therapy context, but also considerably affects their everyday living for the better and gives them a quality of life, which we have difficulty in otherwise providing," Deputy Manager of Residential Care Home for Adults with ASD (Autistic Spectrum Disorder) who receive therapy at BCAT. The economic climate, and the public sector cuts needed to bail out the banks, means that funding for people to get music therapy is being hit hard. BCAT urgently need a modest cash injection now. Just one of the banker's bonuses received last year would keep BCAT running for 10 years, so frugal and self financing is their operation, and yet BCAT offer therapy to hundreds of clients every year. Music is important to TNT-audio readers as Music Therapy is to BCAT's clients. There is an obvious shared interest. Music can benefit everyone's mental health, which is why TNT-audio readers are probably among the most well adjusted in the world. We can share that largesse and benefit those whose lives might be transformed by helping BCAT stay afloat. At no personal expense, you can support BCAT by signing up as a Facebook friend. Perhaps your Facebook friends will also sign up and become supporters or even donors to keep this valuable therapy service available. 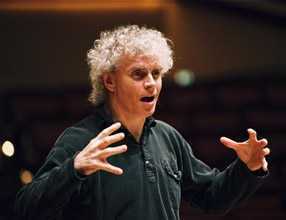 Sir Simon Rattle, Chief Conductor and Artistic Director of the Berliner Philharmoniker and Principal Artist with the Orchestra of the Age of Enlightenment, is patron of BCAT, so supporters are in good company. You could donate to support a child's Music Therapy treatment here, or to keep a space open for groups to receive Music Therapy, Dance Movement Therapy, Art Therapy, Drama Therapy or Play Therapy. Your old scribe benefitted from creative therapies when brain damaged after a motorcycle accident, so I know how profound the difference it can make. Those in hospital with similar injuries at the same time as your old scribe (over a decade ago) I have returned to work, become a TNT-audio reviewer and lead a fulfilled, indeed music filled life. Of those in hospital at the same time (a group of a dozen who keep in touch) who were less fortunate, and did not receive such a range of therapies, only one other has returned to work and he only part time. One example is only an anecdote, not viable evidence, but this one example is typical of the pattern that emerges everywhere the arts therapies are available compared to those who do not get creative therapies offered to them. Music Therapy, and all the creative arts therapies, make connections and help those where other therapies are lost for words. There are no medicines that can do this. However advanced we like to imagine modern medicine has become, therapies based on the earliest human activities (evidence suggests music and art have been practiced throughout human evolution) are still able to achieve unique results. TNT-audio readers can help this continue at one of the foremost centres where Music Therapy is available. Pedantic readers who spotted the split infinitive in the second paragraph should note that Fowler's insists that a split infinitive may be used if its avoidance would lack style. Here at TNT-audio.com we always take the stylish path. Funny, the plebs chorus never commented on it.